The course offers the most scenic half marathon in Northern Ireland, taking in the spectacular scenery of the Antrim Coast Road with its sheer cliffs on one side and sea views on the other. Not only does the event enable fun runners, joggers and club athletes to take part, but for those planning to complete a full marathon the event is excellent preparation, particularly for the Belfast Marathon in May. 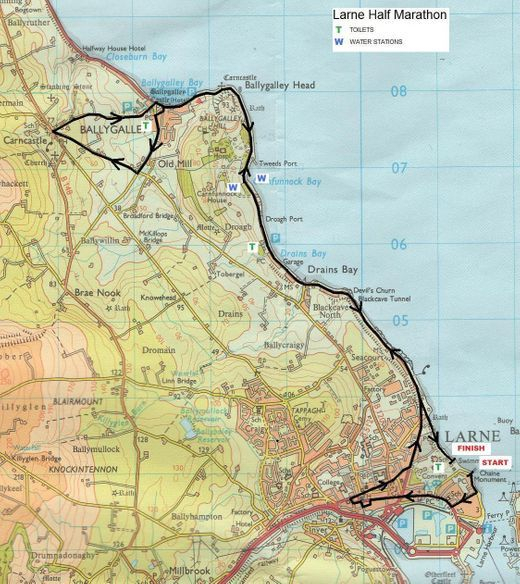 Due to safety and oganisational reasons, the race will use the start location first used in 2016 at Chaine Memorial Tower running towards Bay Road away from the Leisure Centre and an alteration of the route through Grace Avenue in Ballygally. Chaine Memorial Road - Bay Road - Curran Road - Main Street - Broadway - Point Street - Lower Cross Street - Upper Main Street - High Street - Pound Street - Victoria Road - Glenarm Road - Coast Road - Grace Ave - Grace Ave North - Croft Road - Weyburn Road - Cairncastle Road - Coast Road - Promenade - Finish at Leisure Centre. © Official Website of The 2018 Larne Half Marathon. Supported by Athletics NI.